About halfway between Kampot and Kep, a rough limestone hill juts out of the coastal plain. 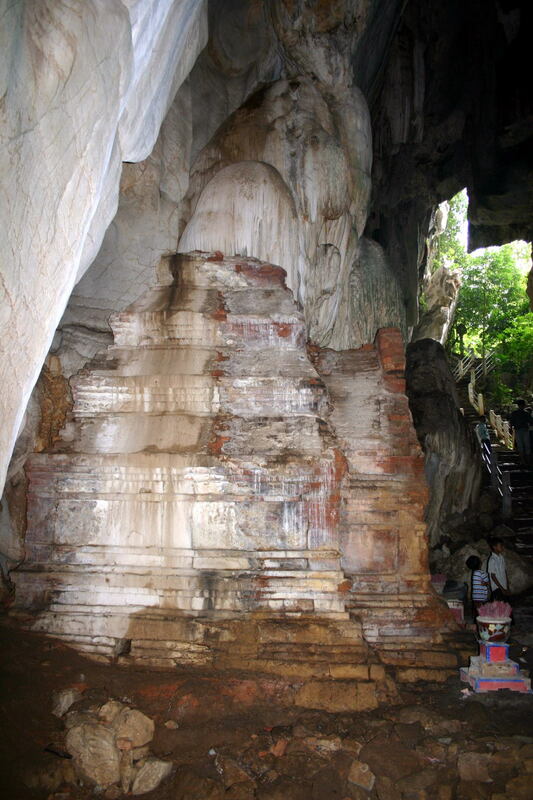 A cave in the hill holds a very old Khmer style shrine. The hill is called Phnom Chosir, or Phnom Sorsea, or Phnom Sasear, depending on which transliteration you believe. The Khmer shrine in Phnom Chosir cave. Access to the cave is through a small country temple. It's about a 100 yard walk through rice paddies and farms to reach the base of the hill, where some Buddha statues guard the stairs to the cave. The entrance to the cave is more or less at ground level, but to reach it you must climb a flight of stairs up and over a large boulder to reach it. From the top of the stairs, you can get a pretty good view of the plain, with farms and rice fields about as far as you can see. Descending the stairs down into the cave, you come to a brick Khmer shrine at the bottom. Stalactites from the roof have grown down into and over the shrine, making it hard to tell where the rock ends and the shrine begins. Inside the shrine is a simple stone plinth holding a lingam. Admission to the temple is US$1.